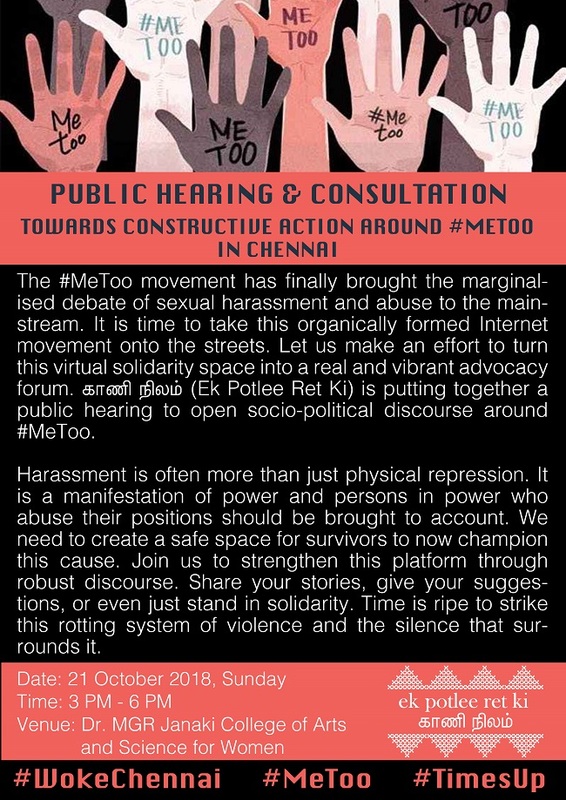 This collective conscience is one that is #woke to gender inequity – a space that does not allow for sexual harassment of women, men, or children to be normalised. In a diverse country with cultural history that spans several millennia, a shift in collective conscience is a continuum. India has lived through such awakenings many a historical time. With changing times, society evolves. Evolution demands tremendous growth. Today, we stand at one such juncture - a time for deep reflection and concerted effort to reposition lost empathy within the human-constructed societal fabric. Equality is illusive. It continues to stay as an ideal that we strive to achieve. An ideal that has held us in focus, like a carrot at the end of the stick. However, equity is achievable. It is a reality that we taste and soon lose sight of, time and again. For the marginalised, equity is their fight and equality their dream. The past week has seen loud echoing of #MeToo; words that are resonating through corridors of power, shattering every normalised glass ceiling. Voices of seemingly powerless people when rallying together can shake the foundations of society, questioning the power of power itself. This organic oneness can potentially cause a shift in social paradigm, making the subjugator extremely uncomfortable within the world they have meticulously crafted, through layers of culturally accepted exclusion. It is through this exclusion that the hierarchy is formed, often misunderstood as top down but with a closer look, it is the digging out of the labouring bottom, leaving only a select few as a posh skeletal façade with hollow insides. Culture is the highest form of existence and people who churn out performance from this culture are custodians of a society’s collective intellect. It is through the arts that the human mind communicates and it is practitioners of these arts, people of great standing and presumable social responsibility, who have today been called out. This alone is good enough to cause churning in our stomach. The responsible have been extremely irresponsible. But what has caused our society even more incredulity is that they are being called out by the nobodies. In this sense, can #MeToo be seen as a somewhat subaltern uprising? It is after all “random”, “innocuous”, “women” who inadvertently set this in motion. Throughout its expansion, it has only managed to gather more insignificant nobodies; young girls, boys, women and men all meek because they have ‘allowed themselves to be preyed upon’. What the powerful ignored has come back to bite them in the backside. Today, the innocuous is infuriated. The meek have mustered their strength to speak up because we are at that point in time when the human is meant to grow. Stagnated in social crises of horrendously normalised sexually predatory behaviour, we have allowed for equity to rot. Individual accounts of survivors of sexual harassment and abuse seem to easily puncture this culture-fed, tradition-bred, carefully knitted veil of morality. There is outrage over “baseless accusations,” rather than over this vicious culture of harassment – more like a plot of a social satire than reality. A righteous society should be indignant of this mass unveiling of deep-seeded moral turpitude. The powerful sexually abusing ones who are less powerful than them. It should not be afraid to question this violence, even perpetrated by members in the highest social order, or shy away from demanding complete accountability. Individual accounts should be shown due respect and solidarity as they become tools to identify the larger vacuum. They will soon be elevated from being one-on-ones to the steering wheels of a collective conscience. I would like to believe the marginalised have become that steering wheel. Women, men, and children who were abused and harassed by power are today spearheading the paradigm shift in de-normalising sexual violence. This is a moment to solemnly celebrate for, we are awake. We are not beyond redemption. The land has its laws, and the laws its strengths. But it is the people who have the spirit. #MeToo is bound to monumentally grow in proportion to take into its fold survivors through the virtual into the real. Once solidarity is found, it is hard to live without. Survivors who have come to a realisation that sexual harassment is not okay, have spoken up within the fortress of camaraderie. This fortress will expand and slowly accommodate all the dug out and excluded masses. So, to all those who have been called out, you have one of two things to do. Either, get off the throne of privilege and repent your way to reformation – justice will be served or fight an unjustifiable, falsely righteous fight and be dethroned by the arriving collective conscience.